Plasma Technology Limited (PTL) was established in 1998 with seed money from the Hong Kong Industrial Department and support from City University of Hong Kong. The technological achievements of the company are recognized locally and internationally. PTL is devoted to the best technological practice and emphasizes R&D, product quality, customer services and technical supports. 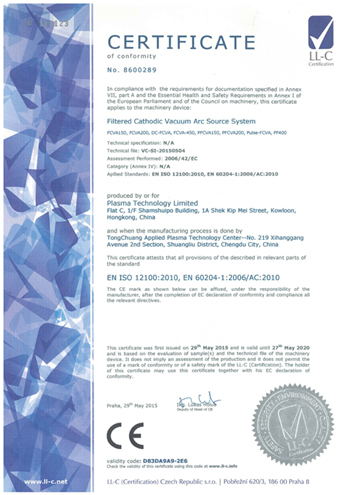 As a result, PTL received the Hong Kong Awards for Industries from the Hong Kong Government in 2004 and again in 2011.
various kinds of Plasma and Ion Sources as well as Switching and Pulsing Power Supplies produced by PTL are popular in system integration. Based on the company"s mission to design and manufacture high quality plasma-based equipment for research and industrial applications, PTL"s staff and engineers are willing to share with and listen to customers to come up with the appropriate and economical technical solutions.